I would like to thank everyone for the positive feedback we received last week. It was great to hear people interested in what we do. This week I would like to introduce a style of collecting we call “key sets.” This is the obsessive act of tracking down every known edition of a single book. These sets can vary slightly depending on the collector. Some of us search for all known first editions and interesting variations while some search for anything that was created with a certain cover. There are some sets, like this one, that can be put together relatively easy. This collection of Uncanny X-Men 266 is a completed set. This is every known first edition published within the same time as the American book. Left to right: Italy, Spain, Netherlands, Brazil, USA and France. Some sets are much more difficult. This Batman 227 set is extremely challenging. Left to right: Brazil (2nd edition,) US, Brazil (1st edition,) Mexico and Lebanon (1990’s reproduction.) Though many international editions may not have the same perceived value as American editions at this moment, a classic Neal Adams cover is still beautiful in any language. Mid-grade copies of the Mexican and first Brazilian editions of this book can easily sell for the same price as the American edition. The first Arabic edition, published in the early 70’s, is extremely scarce and the price for a decent copy is anyone’s guess. 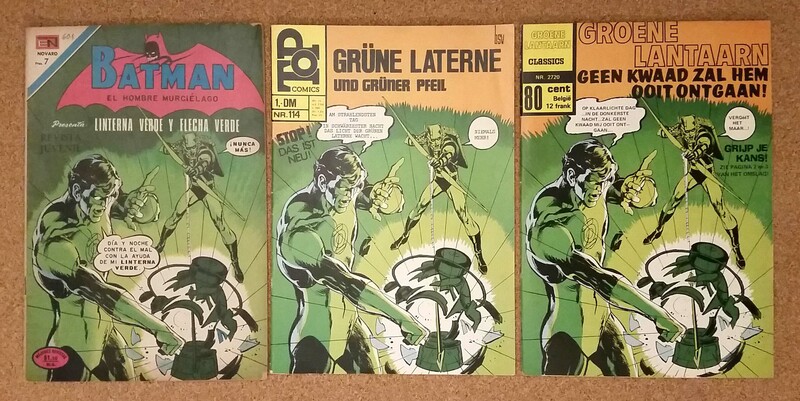 Green Lantern 76. Left to right: Mexico (with Spain price variant,) Germany and the Netherlands. Here is another classic Neal Adam’s cover. This was a set I started early on and still have yet to complete. There is a very tough domestic Mexican edition. It looks exactly like this first one only without Spain’s “pts. 7” price in the top left corner. All three of these editions were published in 1971. The Mexican edition is titled “Batman” because foreign publishers were charged by title. To get around the extra cost, they merged many different series under the same title. You can find this trend in other countries as well. 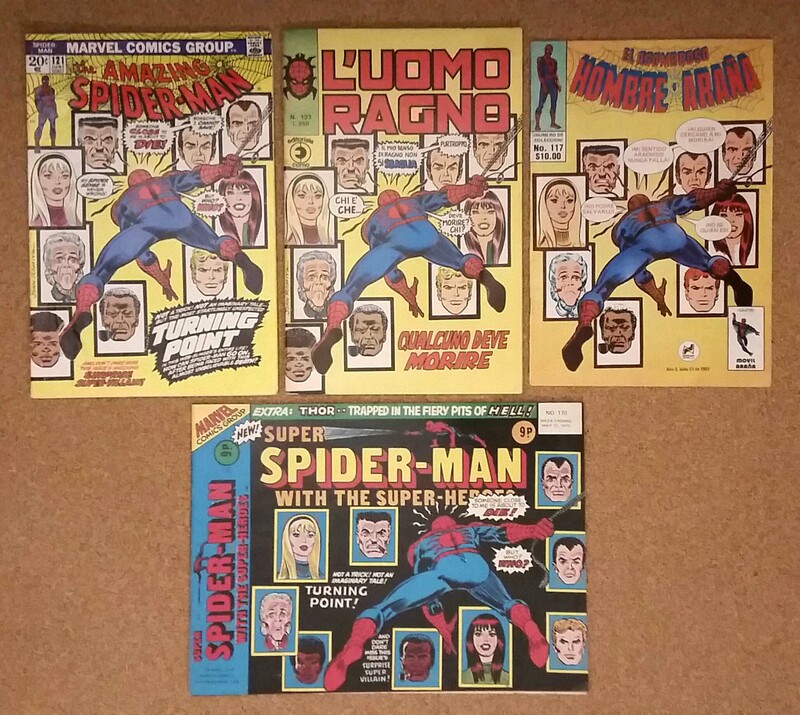 Amazing Spider-man 121 set. I am still missing a few. Left to right: US, Italy, Mexico (2nd edition) and UK. Most of you are probably familiar with “pence editions.” UK editions were printed in America with UK prices and then shipped overseas. Somewhere in the 1970’s, that system stopped on Spider-Man. They were replaced with these “Weeklies.” The Spider-Man weekly would change format and title several times but continued the same numbering into the late 1980’s. This series is the first time some of these major keys were published in the UK. This second Mexican edition was published in the early 80’s. It was also a weekly and is very scarce. 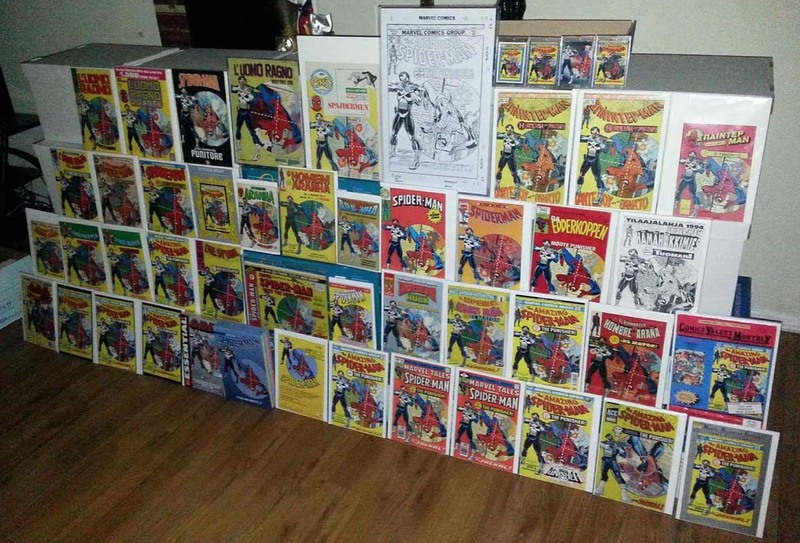 This Amazing Spider-man 238 set belongs to Liam, one of our board members and creator of the foreign comic database. I love the different color variations in this set. The last copy, on the bottom right, is the first UK edition and it is nearly the size of a Life magazine. Though the format is different, the numbering belongs to the same series as the UK 121 previously shown. 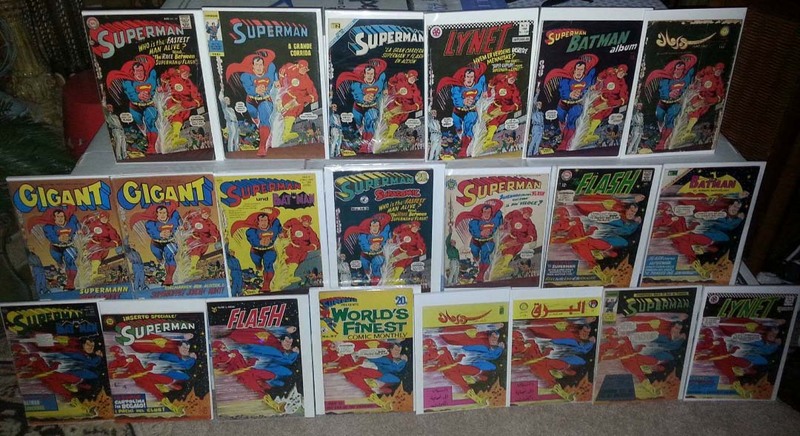 Superman 199 and Flash 175 – The great Superman/Flash race books. These two sets belong to Tony, another one of our members. He has been researching and chasing these for years. He swears that this is every edition ever made. Top to bottom, right to left: US, Brazil, Mexico, Norway, Netherlands, Lebanon. – Row 2: Norway, Sweden, Germany, Australia, Italy, US, Mexico. – Row 3: Germany, Italy, Italy, Australia, Lebanon, Lebanon, Brazil and Norway. The toughest editions here are the Australian, Lebanese and Norwegian editions. 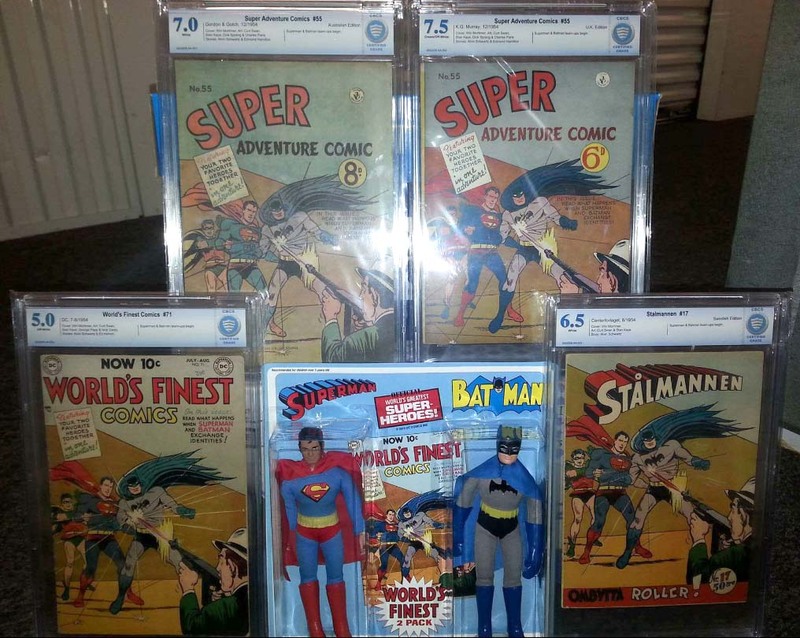 This World’s Finest 71 complete set also belongs to Tony. First Batman/Superman team up. Left to right: Australia, UK, US and Sweden. This is every known edition at this time. Serious foreign collectors use CBCS. They have a dedicated foreign expert who properly notes our comics. We have all had serious problems with the other company mislabeling our books due to insufficient knowledge or caring. 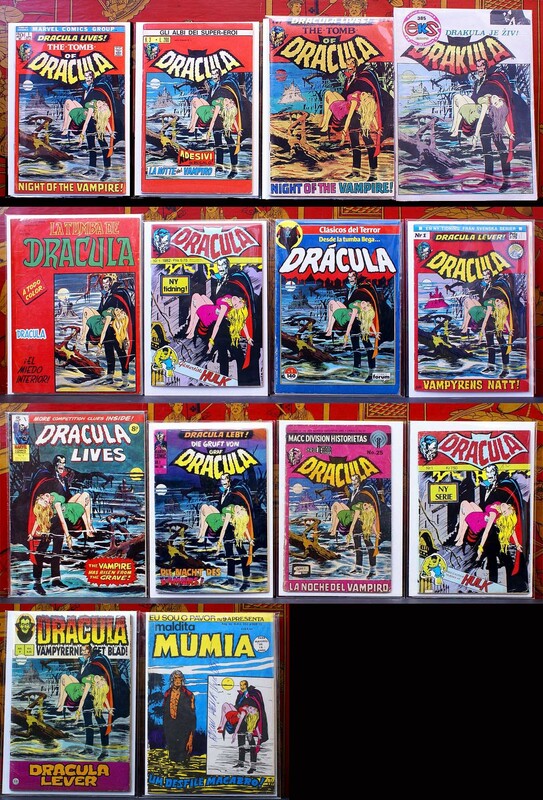 Tomb of Dracula 1 set owned by Define999. One of the great international sets with such interesting variations. The “Mumia” at the bottom is from Brazil and was only recently discovered. Another tough one is the pink MACC DIVISION copy from Mexico. I have been searching for a copy of that book for years. One of the greatest key sets ever assembled is this group of Star Wars 1’s by Define999. There are many editions in here that are noteworthy but the most impressive are the Filipino, Indonesian, South African and the newly discovered Lebanese edition in the bottom right corner. Many of these were unknown even to the biggest Star Wars collectors in the world. We already covered the Filipino books in the last article so you know how tough that one is. The Indonesian edition was discovered two years ago. So far we have found maybe 6 copies. They are complete bootlegs and feature some wonderful original inspired artwork. The South African edition was only available for sale at the premiere of the film in South Africa. It had a very high cover price and not many survived. We know of 4 copies (3 ½ to be exact.) The Lebanese edition was discovered earlier this year. It was published in 1977. So far it is the only one we have found. Define999 was invited to feature this set on an episode of this season’s Comic Book Men. Unfortunately the producers chose the guy with the used Slurpee cups instead. 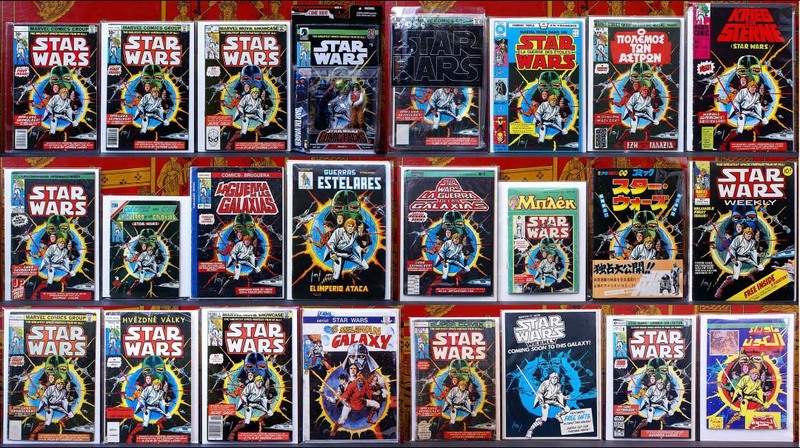 This incredible Star Wars comic set ended up on the cutting room floor. You may have seen pictures of this set floating around the web. 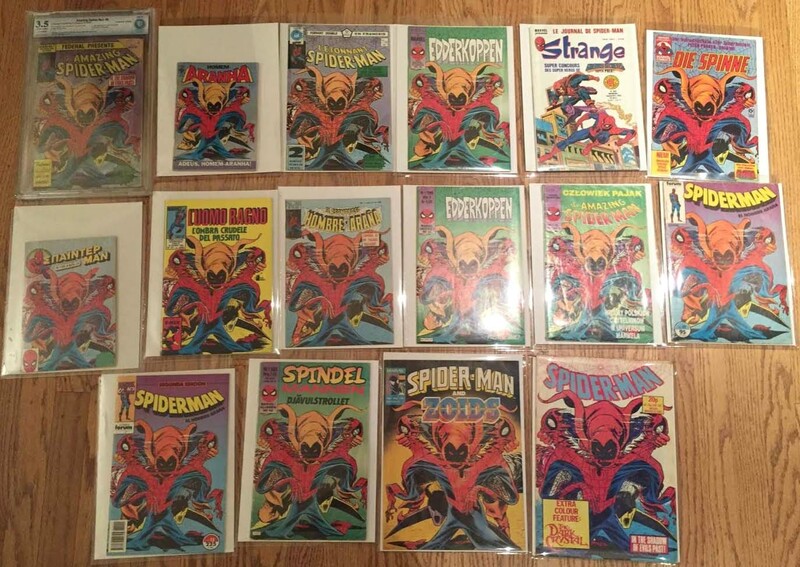 It belongs to Tony and it is the world’s largest collection of Amazing Spider-Man 129’s. It took years to assemble these books. Obviously this is one of the most popular comics and you can find different editions on eBay from time to time. They range in price and for someone not familiar with the market, it can be intimidating not knowing what you should pay. This is something that takes time to learn and there is no guide to help you. If you are interested in finding some of these, I will give you this advice. The Colombian edition should be purchased at any price. The 2 Greeks, 3 Brazilians and the Yugoslavian edition are also among the hardest to find. The rest are not easy but they do tend to pop up. 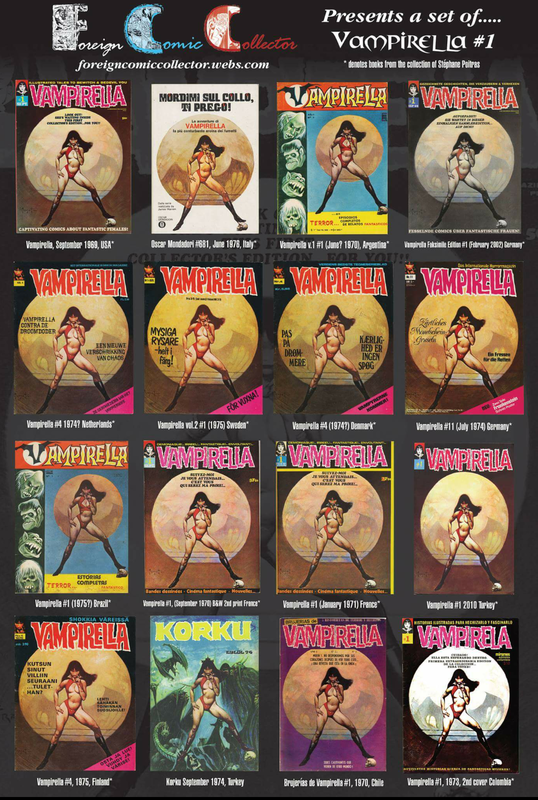 I’m going to leave you with Stephane’s collection of Vampirella 1’s. Another one of my favorite key sets. A difficult and expensive set to chase. If you have any questions or need advice on finding foreign books, come stop by our forum. You can also find us on Facebook and Instagram. Wow. Loved seeing all those sets! Loved the article from last week too. I currently have a nice Avengers 57 set I’ve been putting together the last few years. Would love to keep seeing articles like these dedicated to foreign comics. Which 57’s do you have so far? I almost posted my set but I didn’t want to article to go on too long. Great article! Love seeing the sets.